A last-minute surge at the close of trading added 75 points to the Dow. I tried to find something to blame it on but after a day of mostly sideways, low volatility trading, it appears buyers finally decided to act. Boeing was up $9.50 for 65 Dow points but only 21 of those points were in the last few minutes of trading. After an 84-point drop at 10:AM the Dow was still trading around the flat line at 12:45. Buyers began appearing in larger numbers and that looks a lot like a short covering spike when that intraday resistance was broken at the close. 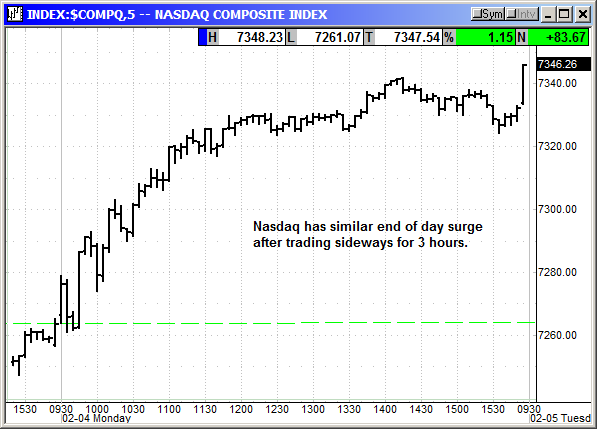 The Nasdaq rallied sharply in the morning but turned dormant around noon. The index is showing the same surge at the close. After the bell Alphabet (GOOGL) reported earnings of $10.91 that narrowly beat estimates for $10.86. Revenue rose $7 billion to $38.9 billion and beat estimates for $38.93 billion. The CFO said the company had authorized a $12.5 billion stock buyback. Shares fell more than 3% because they said spending was going to increase significantly in order to support future growth. Expenses in Q4 were $31.07 billion with capex up 64% to $7.08 billion. For all of 2018 capex was $25.46 billion. That is a lot of research and infrastructure. Fortunately, the Google loss did not impact the futures. The Nasdaq futures are flat and S&P futures down only $1.50. 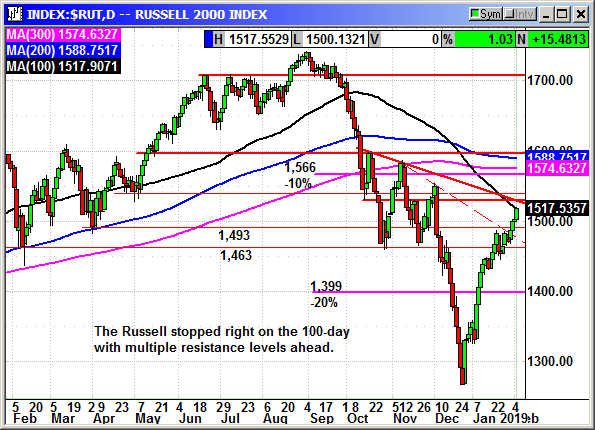 The Russell futures are actually up $1.50 and that is very positive. 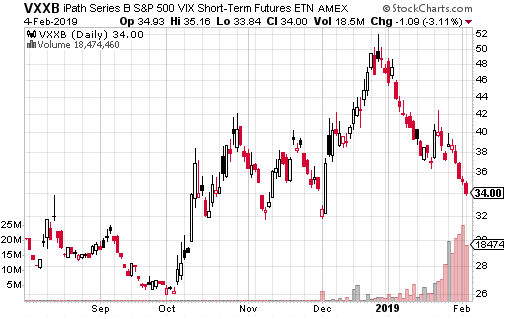 The buy program, short covering or whatever right at the close is more than likely lifting the futures because it caught everyone off guard. The last minutes surge powered the Dow even higher above 25,000 and it has not closed above all three 100, 200, 300-day averages. 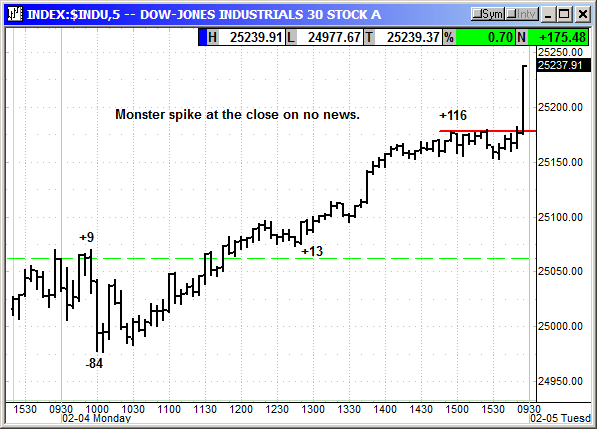 That cluster of convergence could have been decent resistance, but the Dow is now on a roll. The next material target is 25,800. 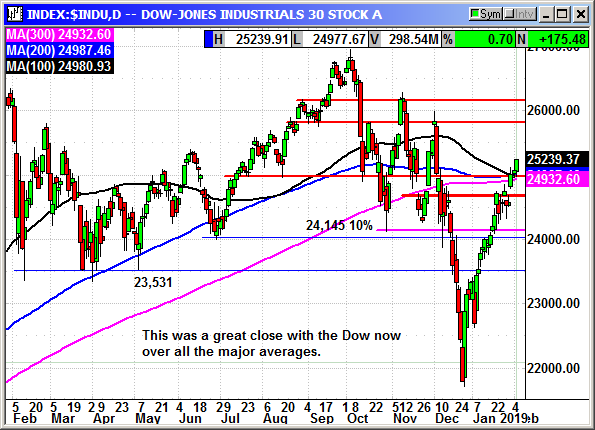 The S&P is still below the moving average cluster and this index does react to averages where the Dow does not. 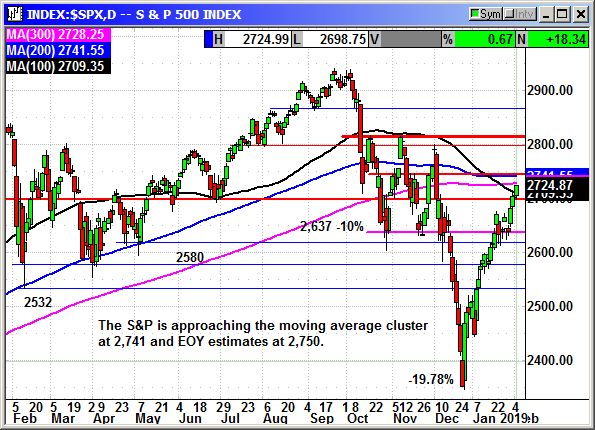 The 200-day at 2,741 and the EOY analyst consensus target at 2,750 should both be decent resistance. The real target is 2,815 and that is likely to happen before the China trade meeting in two weeks. 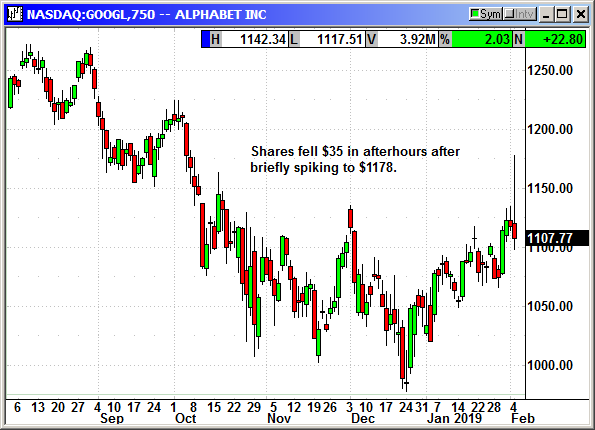 Google falling $35 afterhours was muted by the $22 gain in the regular session. 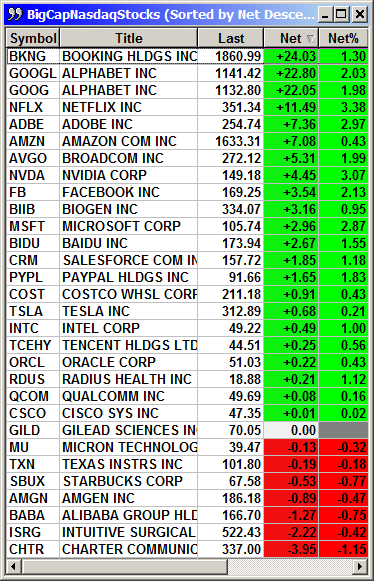 Netflix continues to be a winner and Microsoft, the highest weighted after Apple, gained $3. Now that Google is behind us the flow of tech earnings will slow. 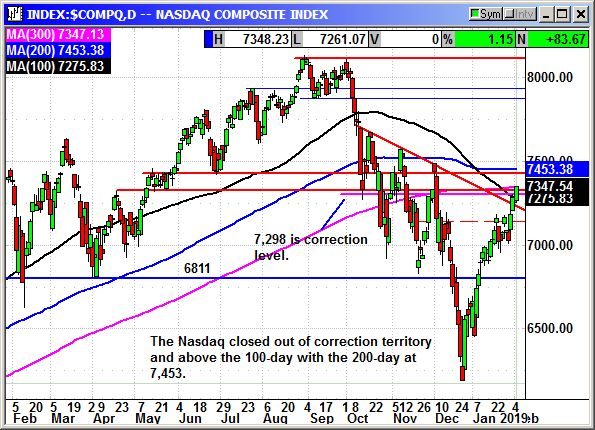 If the Nasdaq can struggle past 7,500 it should draw cautious investors off the sidelines. 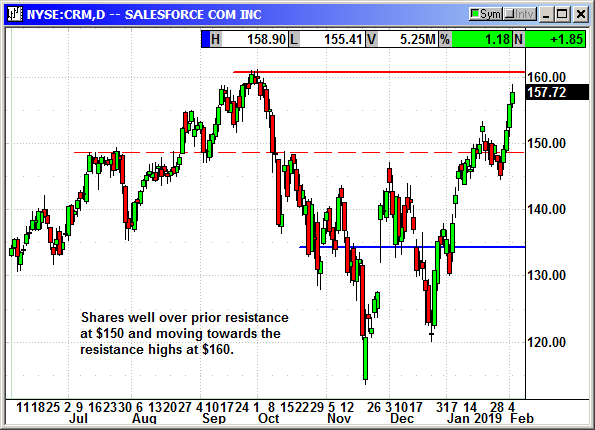 The small caps continue posting gains, but the index stopped right on the 100-day at 1,517. The next 50 points are going to be a challenge. Small cap earnings begin to flow next week. 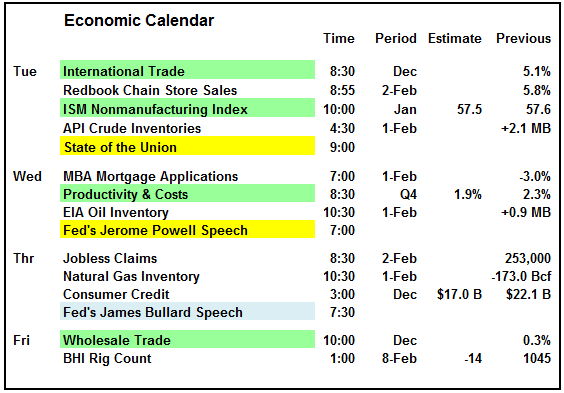 The State of the Union and Fed Chair Powell's speech are the two potential hurdles this week. You never know what each of those individuals are going to say. The ISM nonmanufacturing and wholesale trade are the most important reports. The earnings calendar is lacking many high-profile names despite the large number of companies reporting. Dow component Disney will report on Tuesday. The challenge for investors is the sharp drop in earnings forecasts. As of last two weeks ago the forecast for Q1 was 8% growth. As of noon today, it was 0.3% and just barely positive. When this turns negative it will be a drag on the market. Investors will be moving from growth stocks to dividend stocks and something that would be expected to weather an earnings recession. One factor holding up the market is the expectations for a trade deal with China when Trump and Xi meet at the end of February. This could be the mother of all sell the news events when it happens. I would continue to recommend caution in this market. A six-week streak of gains is just asking for a pause to reset. Look to buy any dip ahead of the China meeting but I would be careful about buying new highs. Buy June $145 Call, currently $4.50, stop loss $131.25. If you want to defray some of that premium you could sell the June $125 put, currently $2.40. Short VXXB shares, currently $34.00, see portfolio graphic for stop loss. The long position was closed on Wednesday. No specific news. Shares moving up nicely. Shares closed at a 4-month high on Monday in a bad market. The saucer base is complete and shares are rebounding. Because of the potential earnings volatility in the market I am going to stay short term with cheaper options and less risk. I am recommending March but the June options are only slightly more expensive and twice the time. Long March $21 Call @ $1.15, see portfolio graphic for stop loss. CAT rallied for the week and moved within $3 of our strike price. Unfortunately, our time is rapidly expiring. I added a stop loss, but I am recommending we continue to hold it rather than sell for 93 cents. All we need is one good day and our option could double. For Q3, they reported a 47% increase in profits but that was not good enough. In Q1 earnings rose 99% and 120% in Q2. Expectations were high. Earnings per share were $2.86, up from $1.95 but just barely over estimates for $2.85. The company affirmed their full year guidance of $11-$12 saying nothing had changed since the last quarter. That should be good news. Any changes would have been expected to be negative. They said the China market remained healthy and produced a 40% rise in excavators in 2018. They previously guided for a $100-$200 million hit from tariffs and said with the year 75% over it looked like the impact would be at the lower end of the range. In any normal period, a 47% increase in profits would be outstanding. Given the sharply declining market and the dumping of anything related to China and tariffs, CAT shares were crushed. In late November CAT said the three-month rolling sales growth for the October quarter rose 18%. That was still good but down from the 21% in September. Total industry sales rose 46% after a 47% rise in September and 35% in August. Energy and transportation retail sales were up 7%, with oil and gas up 20%. The report showed some slight moderation, but it was still a good month despite the tariffs. With the Chinese trade talks accelerating the odds of a deal are improving. The Chinese Vice Premier showed up unexpectedly at Monday's talks signifying China's interest in actually doing a deal. 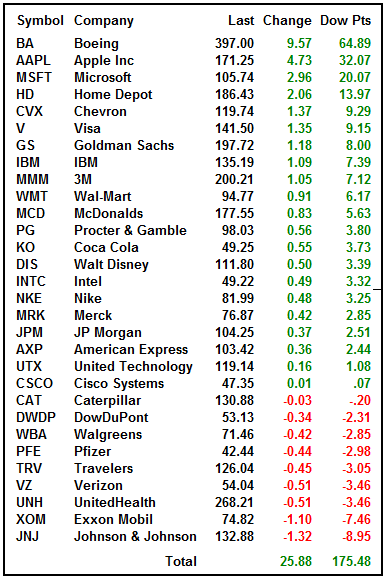 Earnings are January 24th. ANY positive news on China will cause this stock to rocket. I am proposing a short term call and then decide ahead of earnings if we want to hold over. Update 1/28: CAT reported earnings of $2.55 that missed estimates for $2.98. That was the biggest quarterly earnings miss in over a decade. However, it was still an improvement from the $2.16 in the year ago quarter. This was the first earnings miss in ten quarters. Revenue of $14.34 billion also missed estimates but was up from $12.90 in the year ago quarter. The guided for 2019 to earnings of $11.75-$12.75 and analysts were expecting $12.73. Here are our options. This is a February call with three weeks until expiration. I do not expect it to return to $135 again. However, with the China trade talks later this week we could get some positive headlines that could lift the stock. Just bringing it back to $130 would inflate the option price. This may be wishful thinking but with a 73-cent premium, we either close now or hold a week and see if the situation improves. The risk is that the 73-cent premium becomes 43 cents. The reward is that maybe it rises to $2 or more on a trade deal. I am recommending we hold it until next week then decide. Long Feb $135 Call @ $3.52, see portfolio graphic for stop loss. No specific news. Shares were volatile last week but support at $210 is holding. Everyone should know by now that Amazon and Costco are not competitors. They do sell some of the same items, but Amazon is not a threat. Costco is Amazon proof. If anything, they are becoming more of a threat to Amazon because their online business is growing rapidly. For December, Costco reported sales of $15.42 billion a 7.8% increase over the year ago quarter. 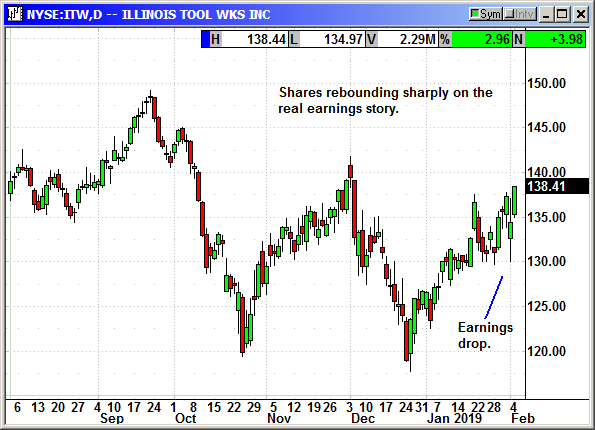 For the quarter ended on January 6th sales rose 9.5% to $52.99. Same store sales rose 7.5% in the US and 6.1% globally. Ecommerce sales rose 13.6%. For the quarter US same store sales rose 10.0%, globally 7.9% and Ecommerce 27.9%. These are dynamite numbers and show no weakness when other retailers are floundering. Shares are recovering from a monster crash in December. I am going to recommend an April call because there are no March options at this time. We will exit before their earnings. Having the expiration after earnings will retain premium until after earnings. Decay should be minimal. 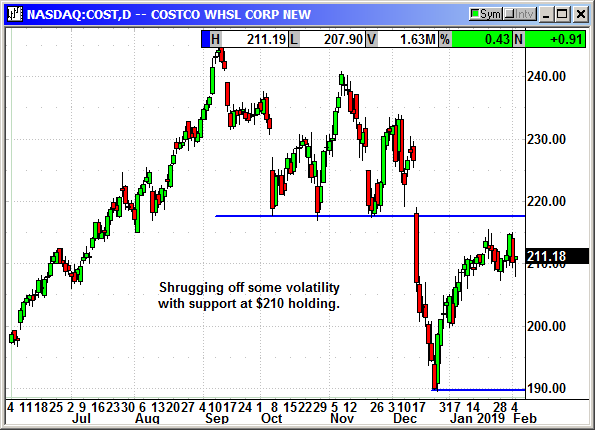 Update 1/28: Costco announced a quarterly dividend of 57 cents payable February 22nd to holders on February 8th. Long April $220 call @ $5.35, see portfolio graphic for stop loss. No specific news. Monster move and now threatening to break out to a new high. Original Trade Description: Dec 10th. 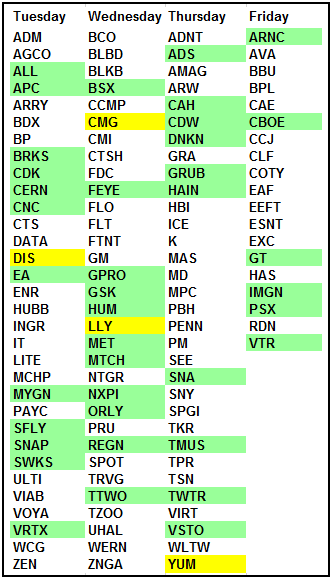 Long Feb $150 call @ $4.50, see portfolio graphic for stop loss. Previously closed 12/20: Long Feb $150 call @ $4.40, exit $1.54, -2.86 loss. 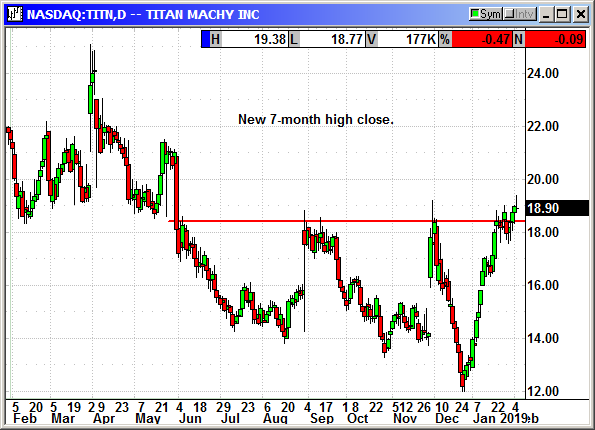 Titan closed at a 7-month high on Friday and declined only slightly today. Shares are struggling to break free of resistance but there is no selling. Think of Titan equipment as the poor man's Caterpillar. 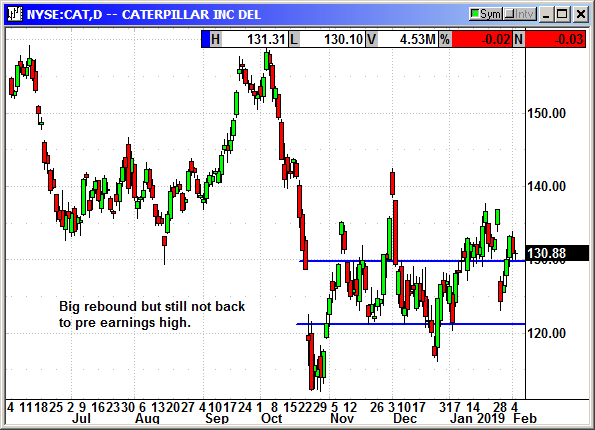 They are a fraction of the size of Caterpillar but their prices are reasonable compared to the yellow metal giant. They reported Q3 earnings of 49 cents compared to analyst estimates for 36 cents. Earnings rose 400% over the year ago quarter. Revenue of $363.6 million rose 10% and edged out estimates at $360 million. They guided for similar sales in Q4 but raised their margin guidance from 8.7%-9.2% to 9.1%-9.4%. They guided for earnings of 65-75 cents. Consensus estimates are well below that level. Shares have rebounded sharply from the December market crash and are right on the verge of breaking out to an 8-month high. 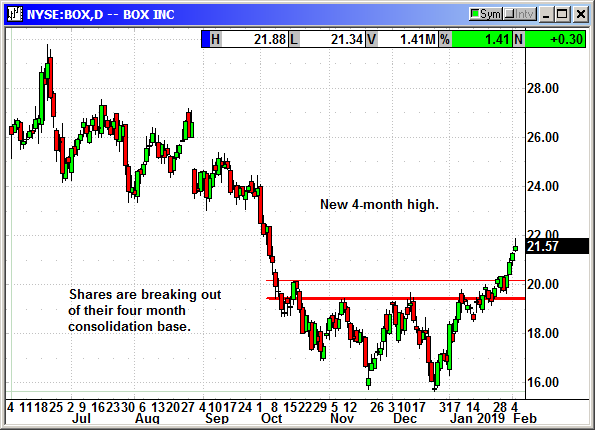 Given their recent gain I would normally not recommend them but with the outlook on China improving and the market in rally mode, I am going to buy the breakout. Options are cheap. Long March $20 call @ 55 cents, see portfolio graphic for stop loss. 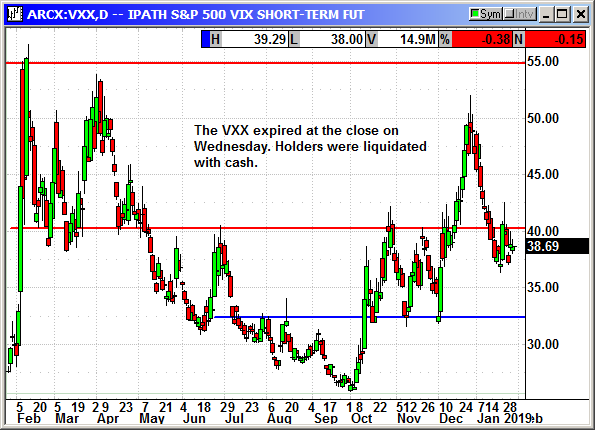 The VXX expired on Wednesday. This caught me off guard. This was a 10-year, fixed time ETN from Barclays. The ten years were up on Wednesday. Holders were paid cash at the closing price of $38.69 so we ended with a decent gain. They replaced it with an identical 30-year product symbol VXXB, so I will not be around so see that one expire. I am adding it as a new play today. 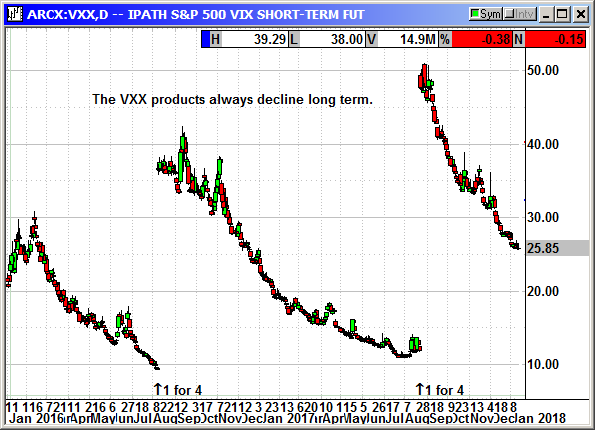 We know from history that the VXX always declines. Closed 1/30: Short VXX shares @ $49.16, exit $38.69, +$10.47 gain.